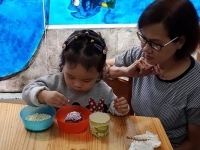 Cambridge Legaspi celebrated Valentine's Day last February 15 as they made their own sandwich, catch lovebugs, prepared the cereals in a bag for their parents! Cambridge Legaspi welcomes the Year of the Pig last February 1, 2019 as we celebrate Chinese New Year! Cambridge Legaspi kids became scientists for a day and made a lot of experiments! It was truly an enjoyable day for everyone! Cambridge Legaspi kids celebrated animal day as they learned how to take care and save the environment! 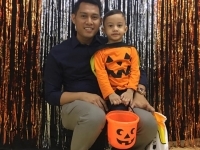 Wearing their Halloween costumes, Cambridge Legaspi kids had a blast and candy-ful day as they celebrated Trick or Treat last October 24. 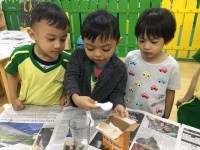 Cambridge Legaspi celebrated this year's United Nations Day exploring the full possibilities of the world with children's dreams and how it can help unite the world. Inspired by Walt Disney's famous line, "If you can dream it, you can do it". The kids wore their what they want to be when they grow up costumes and had a parade. Cambridge Legaspi kids together with their grandparents amd guradians helped each other in making their own sandwich and cupcake. They also played games that allowed them to exercise and move their bodies. The Junior Nursery kids took turns in playing the "Tumbang Preso". 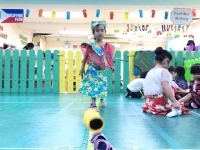 Senior Nursery and Kinder Class got to experience the game of "Patintero" and everybody enjoyed it! 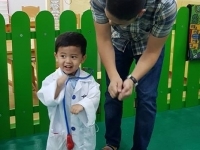 Cambridge Legaspi kids had a fantastic time flaunting their costumes and being superheroes for the day. They saved a civilian by passing over some obstacles and stick trash in the sticky web. It was a super fun day for everyone! The Nursery kids had a blast as they had a first hand encounter with the animals in Ark Avilon. They met different kinds of animals and also fed them some snacks. Hooray Nursery kids! "Stop, Drop and Roll"! The Cambridge Legaspi kids learned how to prepare themselves in case of a fire or earthquake. 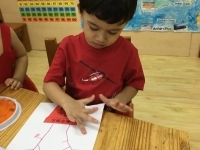 They participated in the activity prepared by our fireman visitor. Everybody enjoyed the stop, drop and roll activity and also the pretend evacuation to the parking lot. Hooray kids! Happy Father's Day! Cambridge Legaspi kids had a blast as they played games with their daddies and guardians. They also collaborated with their daddies in making their own medal saying, "#1 Dad". To end the event, they ate some yummy treats while they socialize with each other. 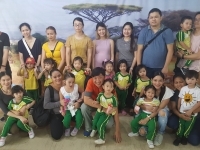 The Cambridge Legaspi kids celebrated Nutrition Day last July 27, 2018. They learned how to eat healthy and keep their body fit and strong. They made a Tuna Wrap prepared by Ms. Ana Salud Lim and practice their dance moves with Teacher Dats.